Make a roux by melting butter with Canola oil over medium heat in a skillet. Once the butter is completely melted, decrease the heat to low, add flour; stir constantly until the mixture is blended and smooth. Add onion into the roux; increase the heat back to medium. Stir until the onion is well coated and fragrant; transfer the mixture to the slow cooker. 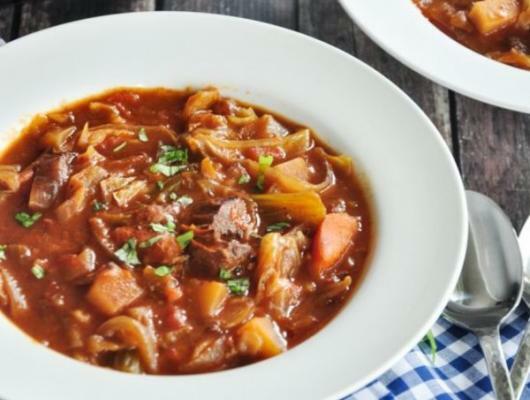 Place all other ingredient except the cabbage in the slow cooker; stir well; cover and cook on low for 8 hours. Add cabbage, switch slow cooker to high setting. Cook for an additional 30 minutes or until the cabbage is tender. Taste and add more salt or sugar if desired. Dish, garnish with basil and serve with your favorite bread. 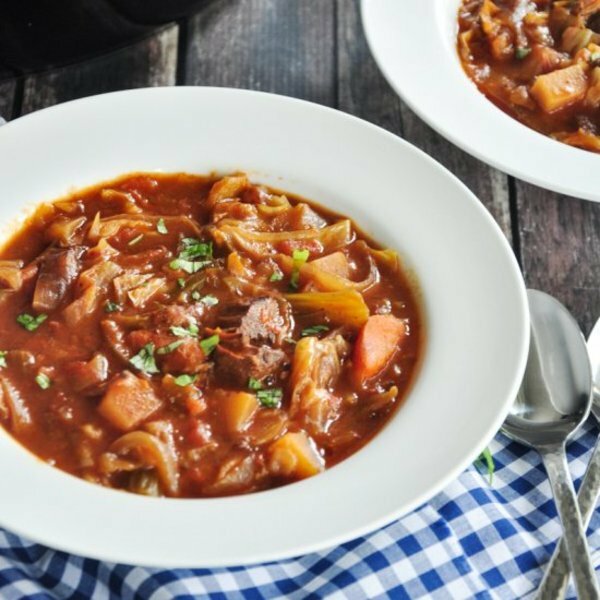 A hearty borscht recipe made with beef stew meat and onion sautéed in a roux and slow cooked in homemade beef bone broth, this Shanghai-style beef borscht makes a delicious comfort meal on a chilly day.